For the maximum success of the artificial reef as a habitat, diving site, and research platform, it is very important that the position and orientation of the ship be controlled. To ensure this positioning, as well as safety during towing and scuttling, engineering simulations are planned to test performance in various conditions. The Davidson Marine Hydrodynamics Laboratory at Stevens Institute in Hoboken NJ has undertaken the project to conduct these tests. Click here for a PowerPoint presentation about the Lab. Stevens Institute of Technology is extremely pleased to participate in the Wreck Vandenberg project. We are excited by the research and education potential of this unique effort. By virtue of its size and location, the Wreck Vandenberg offers a unique opportunity to conduct leading-edge ocean engineering and coral reef ecological studies. The project also represents a significant opportunity to educate students across an array of scientific and engineering disciplines, and inform the general public about issues related to coral reef habitat restoration and preservation. A research project aimed at identifying the viability of using chemical cues imbedded in an engineered calcium carbonate structure to enhance the recruitment and settlement of coral larvae. This project will be conducted at several locations along the decks of the Vandenberg, using various “control” (untreated) substrate as well as the engineered substrate in order to enable the assessment of the success of the proposed design. If successful, this design would significantly enhance efforts to repair coral reef habitat destroyed, e.g., by ship groundings. A long-term monitoring project to examine the material behavior of the wreck, that is, the rate of decay – if any – of the hull. By conducting field measurements of hull thickness over time and at various locations along the hull, we will characterize the long-term behavior of the structure, and identify the factors contributing to any perceived variability in rate of decay – e.g., proximity to water surface, presence of marine growth/coral. Long term monitoring of the stability of the wreck, that is, the response of the vessel to extreme storm events. An exciting new educational venture that seeks to educate and inform US students and the general public by following the wreck project from beginning to end, including the cleaning process, the towing of the vessel from Virginia to Key West, the actual sinking, and the structural and biological transformation of the wreck over the ensuing years. Each of these aspects of the project will form an educational “module” that can be used by science teachers from grade school through university, and by ocean engineering and naval architecture educators. We anticipate that Stevens will work with the Florida Keys Community College in developing project-based curricula for use in oceanography, marine biology, ocean engineering, and naval architecture courses. Stevens has been a pioneer in the use of project-based learning to enhance the undergraduate experience in science and engineering. Stevens has also pioneered the use of the Internet in the development and delivery of project-based learning modules for use by grade school and high school teachers. Stevens’ Center for Improved Engineering and Science Education (CIESE) was established in 1988 has worked with school systems around the country to assist teachers in using computer technology to enhance instruction and student achievement. As wireless bandwidth continues to grow, another exciting use of the wreck as an educational platform is evolving – the use of the Wreck Vandenberg as an “underwater classroom”, with lectures conducted in real-time over the Internet on topics ranging from marine biology and ecology to ocean currents, wave dynamics and underwater structure behavior. We look forward to an exciting and productive partnership with Artificial Reefs of the Keys! It has been proposed to bring the decommissioned ship USAFS Gen. Hoyt S. Vandenberg to the Florida Keys and sink it in waters 140 ft deep to serve as an artificial reef. At 520 ft long and 100 ft deep (keel to top of antennas), this will be the largest ship ever intentionally sunk for this purpose and will become a world-class diving destination. The vessel will become a habitat and breeding site for countless marine species and offer many other benefits to the environment and to education and research. A 1/70th scale model of the ship including the superstructure will be constructed. The model will have pluggable openings of the 7 ft x 10 ft rectangular access holes and another set of small holes at various locations to allow water entry during the “sinking” studies. 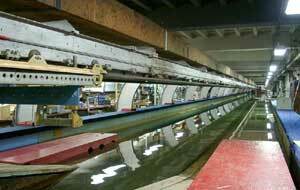 Calm-water Resistance Tests on the bare hull at different drafts will be conducted in the Davidson Laboratory High Speed Test Basin . Instrumentation will be installed for the measurement of resistance, trim angle, and heave motion. Seakeeping tests will be made at different drafts and access hole opening configurations. Measurements will be made of Drag, Heave and Pitch and statistical analysis will be performed to obtain significant values (1/3rd highest, 1/10th highest and extreme values) of the motions. Incidences of water entry through the openings will be observed. The sinking studies will be performed in the laboratory square basin with the water depth reduced to 2 ft (representative of 140 ft full-scale depth). Tests will be made under different scenarios that include variations in number, size, location and timing of hole openings for water entry. The sinking will be recorded using both surface and underwater video cameras. Link to Ocean Engineering Dept.